Loading a Pinzgauer - THE PORTAL HUB - Pinzgauers, Haflingers, Volvo 303s and more! I work for AAA and was asked the other day by one of my co-workers how he'd go about winching a Pinzgauer onto one of our roll back/ tilt and slide truck beds, this got me thinking. The obvious option would be to attached the winch to the front tow pin although this is plenty strong enough the problem occurs that the pin is too high and the winch is nearly always mounted low usually bed level so that as the Pinzguaer gets closer to the winch it pulls downwards way more than forward (you could maybe get away with this if the truck bed was long enough) I don't know what the maximum nose weight is for the Pinz but I'm sure the hydraulic winches we use will not stop pulling just because the front springs bottom out. The second option I think most tow operators will go for is to use to large "J" hooks they look like meat hooks and kinda old school brutal, although the lesser angle would work for loading the issue would be the two hooks may slide inwards under load damaging the inner axle boots. The best solution I came up with would be to run the winch wire all the way under the truck and attach via a strap to the rear tow hitch. Anyone know a better method or got a horror story? I do not like using J hooks on the axles because of possible damage to the brake lines, on trailers, the unsprung springs can bounce the trailer all over the place. There is a video of a Mog almost flipping a trailer because of this type of tiedown. The use of J hooks in the outriggers is the best method front and rear to secure a Pinz down. It compresses the springs to have the least amount of movement. There is a BIG difference between hauling a Pinz on a rollback flatbed and on a trailer and using axle or tire straps. Both leave the suspension uncompressed and able to move up and down unrestricted with road condition. A rollback truck weighs a minimum of 11,000 lbs or more, and the momentum of the bouncing 4300 lbs Pinz will usually not be felt, but on a 2000lb +/- trailer, the trailer actually can become a pogo stick, reacting to momentum of the Pinz suspension. Remember, a majority of cars on the road in the US are mostly under 3500 lbs, a wider stance than of a Pinz , under 5' high and a lot less suspension travel, so the tire straps are a simple, quick solution for a tow truck driver for a relatively short drive. And for other vehicles they have a complement J , T and chain hooks for anchoring the frame down. Lewis, the front tow pin is fine to pull by, but not to anchor to on a deck. On my old 716, I had (presized) chains w/ j hooks that allowed me to quickly hook up one end of the truck and only need to tension the other end. Later 716 and my 718 had a bunch of tiedown points... enough to baffle any driver. I could see a trailer being a much bigger issue for the Pinzgauer than a rollback and like you said even our smallest trucks don't really have an issue with big and bouncy! I think that the diagram is from a British made, ATL 718K might have something to do with it being in English. 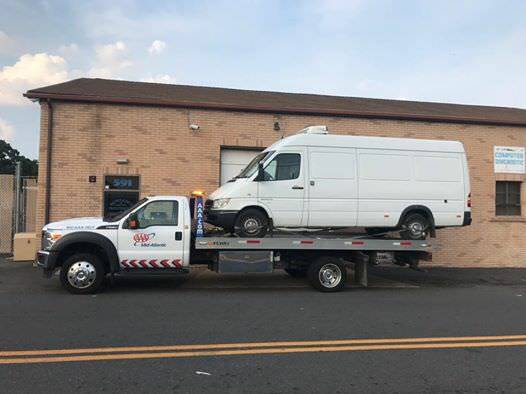 Though the Sprinter may be within the payload capacity of the the rollback, with as far back as the rear wheels are on the deck, the offloading of weight from the front axle of the rollback could be an issue for steering over a bump or dip. As far as the sprinter the majority of the load is still forward of the rear axle of the ford 550, so no effect.... however when I used to use a single rear axle heavy unlift it was good practice to stab the brakes before steering hard, that was some seat of the pants stuff!